customize with supportMessage.html in theme directory Try properties nearby instead. Note: It is the responsibility of the property chain and/or the individual property to ensure the accuracy of the photos displayed. This website is not responsible for any inaccuracies in the photos. With a stay at Wingate by Wyndham - Tampa USF in Tampa, you'll be minutes from University of South Florida Botanical Gardens and University of South Florida. 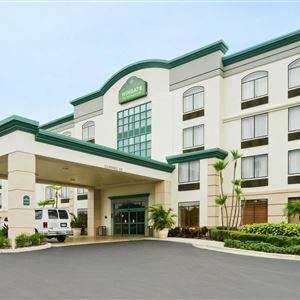 This hotel is within close proximity of University of South Florida Contemporary Art Museum and USF Sun Dome. Make yourself at home in one of the 86 air-conditioned rooms featuring refrigerators and flat-screen televisions. Your room comes with a pillowtop bed. Complimentary wired and wireless Internet access keeps you connected, and satellite programming provides entertainment. Private bathrooms with showers feature complimentary toiletries and hair dryers. Enjoy a range of recreational amenities, including an outdoor pool, a spa tub, and a fitness center. This hotel also features complimentary wireless Internet access, a television in a common area, and tour/ticket assistance. If you're planning a day at a nearby theme park, you can hop on the complimentary shuttle. A complimentary buffet breakfast is served daily. Featured amenities include complimentary wired Internet access, a 24-hour business center, and express check-in. Planning an event in Tampa? This hotel has 925 square feet (86 square meters) of space consisting of conference space and meeting rooms. Free self parking is available onsite.